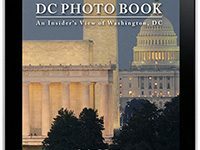 DC PHOTO BOOK is now available on the KINDLE FORMAT! The digital version includes more photographs than its print counterpart, as well as additional commentary and resources. Digital books offer more possibilites in terms of content and interactivity, and it’s been exciting to redesign for this platform. Jewel of the Mall. Today, veterans from Chicago, Kansas and Missouri visited the WWII Memorial and had to be shielded from the many Congressman and Senators who showed up for a free photo op when the nation is shut down because of their incompetence. WWII MEMORIAL: Veterans turned away? September 30, 2013 | Comments Off on WWII MEMORIAL: Veterans turned away? The type alterations to the Martin Luther King Memorial were just fixed n time for the 50th Anniversary of the 1963 March on Washington. As I am frequently at the WWII Memorial greeting flights or wandering the Mall to the various bookstores, I am always on the lookout for new “opportunities”. I had been quietly lusting after the crane that Hayward Baker and Clark Construction had on their building site but held little hope. Senator Bob Dole’s 90th Birthday! July 22, 2013 | Comments Off on Senator Bob Dole’s 90th Birthday! The show of WWII Memorial images is entitled a “A Memorial Comes To Life” and the prints are almost all in place. The Women In Military Service To America Memorial is an extraordinary building both inside and out. I will have the grood fortune to be signing the WWII MEMORIAL and DC PHOTO BOOKS this Monday April 1st (1-4 PM) and Thursday April 4th (1-4 PM) at the National Park Service Cherry Blossom Festival tent run by Eastern National. Watching the anticipation and transition on the Mall from gloomy Winter into exuberant Spring is always fascinating. I am also hoping to do a morning broadcast on WTTG/ Fox news show sometime during the week. DC PHOTO BOOK at the Spy Museum! March 7, 2013 | Comments Off on DC PHOTO BOOK at the Spy Museum! It’s quite a wonderful collection and everyone who put it together deserves thanks. DC PHOTO BOOK just arrived and I am reminded of the various inaugurations I have photographed. I am happy this year to be working indoors! It’s been an amazing year and I am looking forward to the 2013. We just reprinted another 20000 “Jewel of the Mall” books and are looking forward to the revised edition of DC PHOTO BOOK which will be arriving end of February. Thanks to everyone for their help and support in this wacky little publishing venture. See you on the Mall!